A subtle yet elegant hue, with utter elegance and sublime chicness. It is a happy, warm colour rejoicing all seasons and all occasions. A colour of warmth, joy and playfulness. If paired with suitable colours, it can do wonders. A colour of great importance and auspiciousness in the Indian culture. A bright yet strongly feminine colour. It holds your site with its marvelous dark hue that is enticing yet subtle. A colour for bridal wear in Indian Culture. It is a classic hue followed by generations, with age no bar. Blush pink hue is yet another subtle hue with great elegance and charm attached to it. A very cool and happy colour for the traditional ceremonies. A flawless hue with great charm and fearless beauty. Bright, high, loud yet a chic outfit fit for traditional occasions to cocktail parties. It is a hue for every occasion, a royalty in colour it brings life to your wardrobe. An eclectic hue, it is a charmer if held eloquently in the attire. Considering the flashy side of the colour, the sober embroideries on it can give the attire a great enigma and charm hard to resist. A risky colour but with such a great charm to carry with. It is the colour which holds great intensity and depth along. 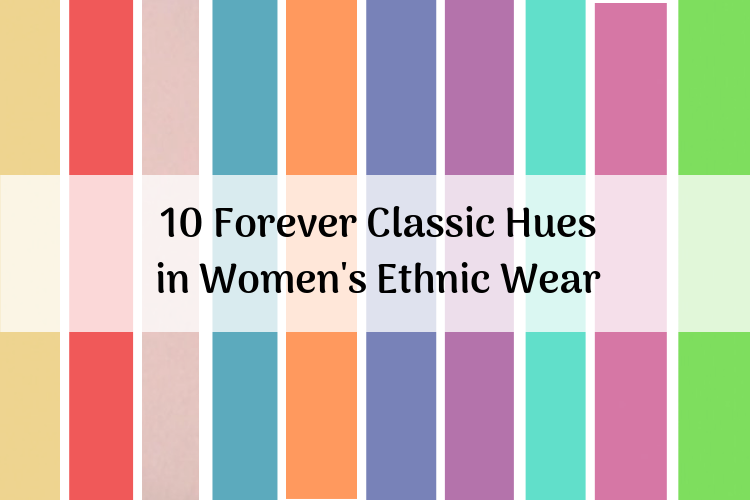 If you choose this hue, pair it with intricate fabric work and heavy ethnic embroidered lehenga or saree. Turquoise blue is a greatly underestimated colour hue. It has an attached calmness and serenity to it which is undividable. It brings in the freshness to your wardrobe and it’s a perfect match for the traditional ceremonies. Another royal colour hue, which also happens to be one of the most loved colours by women while opting for traditional attires. It has a great glow and depth to the colour. Its sheer richness steals the show. Purple is the colour of luxury, richness and purity. It is an embodiment of luxurious attires. It is a perfect blend of the modern richness and the traditional twist with the fabric work and the heavy detailing work can make it a must have for all times. A classic hue and an understated hue yet again. Mint green is such a fresh colour which is related to luxury and calmness. If paired with zari, it plays magic on the wearers' body.